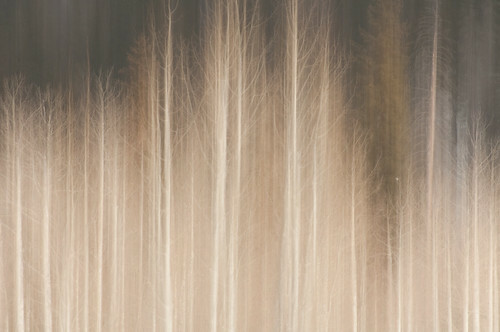 Aspen Abstract, Duck Creek, Utah, originally uploaded by DaveWilsonPhotography. I’ve been back from my Utah/California/Nevada photography trip for 3 days now so figured it was about time I post a wrap-up containing some of the lessons I learned while shooting with Raul Touzon last week. Overall, the trip was a whirlwind of 10 to 12 hour shooting days covering 1800 miles with 5 photographers (Raul, myself, Enrique, David and Wayne). I shot something over 3000 exposures and will be editing for weeks. Watching Raul work was inspirational and sobering at the same time. I’m completely convinced that he could make great pictures inside an empty, white room. While I was off shooting the tourist sites of Zion and Bryce Canyon, he was making amazing images of snowbanks and traffic signs. Thinking outside the box doesn’t even begin to describe the level of creativity I saw last week and this definitely pushed me to stop thinking postcard snaps and start looking for something different to shoot. I’ve been shooting a lot of HDR for the last couple of years and it’s definitely made me sloppy in my exposure choices. For HDR, as long as I bracket widely enough to get all the highlights and as much of the shadow detail as possible, it doesn’t really matter if any one image has correct exposure for particular pieces of the scene – the HDR processing will determine the light level and the tone mapping will give me a usable image. As a result, I’ve not tended to think too carefully about the exposure I want for given areas of the scene other than making sure that I don’t clip my highlights when I’m not shooting for HDR. This is a big mistake. Talking to Raul and doing some bracketing experimentation, I realised (once again) that a half stop over or underexposure really can make a huge difference in the image and that it’s far better to get the exposure right in the camera than put up with something that is slightly off and try to fix it later in Lightroom. Although I shot brackets for HDR on Monday, I pretty much stopped for the rest of the week and concentrated on back-to-basics, single frame photography. I still bracketed a great deal but this time I was shifting half a stop between exposures looking for exactly the right place for the scene rather than trying to capture the whole dynamic range as I would for HDR. Even when doing HDR in future, I will be adopting the same approach – get the center exposure dead on for the most interesting area of the image then bracket around this. When doing exposure fusion, I will be even more careful, making sure that the individual shots are exposed such that each important area in the image is correctly exposed in at least one of the constituent images that are to be merged. No doubt you are thinking that this is all pretty obvious and I suppose it is but, realistically, how often do you bracket half stops looking for the perfect exposure these days? I bet I’m not the only one who is lazy here. I ate crow last week on the whole Aperture Priority vs. Manual debate then had second thoughts when I realised that the “new” method Raul proposed was exactly what I had been doing 25 years ago on my 35mm cameras. Shooting manual for the rest of the week, however, I am now 100% convinced that it is the mode to use when shooting landscapes and in situations where you have time to set up a shot and shoot a few brackets. With aperture and shutter speed dials easily accessible with one hand, changing the exposure is really quick and easy in manual mode allowing very quick bracketing without the need for any double button pressing (as in the exposure compensation case) or menu manipulation. Give it a shot and see what I mean. I knew this already too but often failed to put it into practice. We concentrated our shooting around sunrise and sunset, picking locations based on the sun angle so that we could get the best possible light for our shots. This really does make a huge difference. Light at either end of the day is softer and warmer, and landscape textures really pop due to the lower angle of the sun. One of the best parts of the trip was early in the week when we climbed a hill in Zion National Park and spent an hour watching the sun go down and the light changing on the cliffs on the opposite side of the valley. Treat yourself to a lazy sunset hour somewhere and really look at what the light does. I bet you’ll like it. One of the huge pluses of taking a photography-specific trip is the obvious fact that you get to take time to take the pictures you want. If you need to hang around 10 or 15 minutes for a break in the clouds, you can (unless it’s at Duck Creek and everyone else is in the van, but that’s another story). Being able to plan where to shoot and when to shoot it makes a big difference in the quality of your pictures and having the flexibility to wait and take 20 or30 shots over a period of 30 minutes is a great luxury. I’m a huge fan of super-crisp images and normally get cheesed off if I can’t count the bricks on a building 100 yards away or the leaves on each tree in a forest. It is, however, perfectly acceptable to throw sharpness out the window (so to speak) if the creative result is appealing. The image at the top of this post is an example – I moved the camera during the exposure to give a streaked, abstract effect. When it comes down to it, if the result is pleasing to the viewer, it works. So you want to take a picture of an amazing vista like Bryce Canyon but you don’t want to do it with your horribly unsharp 10mm lens? (Yes, I know I said sharpness isn’t everything but just forget that for a minute or two). Why not use your lovely sharp lens and shoot a panorama instead? Photoshop CS4’s panorama stitching is so good that I can seldom find the joins in a stitched landscape shot. Remember to switch to manual focus and manual exposure so that each picture in the panorama doesn’t suffer from focus or exposure differences then take as many shots as needed to capture the whole scene. Remember, too, that a panorama doesn’t need to be just a single row of pictures – you can shoot an array say 3×2 or 3×3 to cover the scene and Photoshop will still stitch it beautifully. I’ve been wondering for a while how to take those wonderful outdoor portraits where the background is underexposed by a couple of stops and the subject is lit by flash. Based on some studio portraiture lectures where I was told that shutter speed controls ambient light and aperture controls the amount that the flash contributes, I had assumed that I needed a wide aperture and short shutter speed to make this work (using a flash that can handle high speed sync, of course). My attempts at doing this, however, had failed miserably. It turns out, however, that the opposite is true for these types of picture. Set the aperture to something really small like f/22 and set the exposure so that you take a 2 stop underexposed image of your background. This will likely give you a shutter speed of around 1/250 or 1/125 which, helpfully enough, is at or below your flash sync speed. Now set the flash to half or quarter power, hold it about 3 feet from your subject and fire off a frame. If it looks good, you’re done. If not, move the flash forwards or backwards to change the amount of light it dumps on your subject until you get it just right. Aside from the great photography opportunities, one of the highlights of this trip was the fact that I was traveling with other avid photographers. We could spend the whole week geeking over gear and doing things photographic, exchanging hints and tips and comparing composition. It was an absolute blast and I would encourage other photographers to get social and shoot in company since it definitely enhances the experience for me. Thanks Dave for your experience comments. Very usefull for me, and I’m sure that for a lot of people too. I’m new in Photography and I read everyday books, magazines, courses, etc. But I realized that this kind of shared experiences like you did is the best learnings. .-= Ariel Botti´s last blog ..Iguana2 =-. Thanks, Ariel – I’m glad you found this helpful. I am heading to Moab Utah in a couple of days. Then heading directly in Arches National Park for 7 days. I have read your comments and suggestions regarding your trip to Utah. I shoot a lot of HDR myself. I will take your suggestions with me.